1. Members and staff of the I.O.C. 5. Members of families of persons in categories 1-4. Identity Card in Helsinki indicated the seat allotted to the holder in the guest stand. 7. Coaches, physicians, technical assistants, masseurs, grooms, cooks, etc. attached to teams. free transport under the arrangements made in this respect by the Organising Committee. How many green and blue cards were in actual use it is impossible to say, for the National Olympic Committees generally neglected to return superfluous cards. 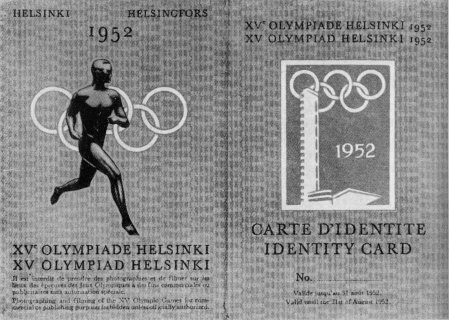 On the other hand, new Identity Cards had to be made out for the entire membership of a few teams on their arrival in Helsinki, the original consignments having failed to reach their destination. 5 Pass Certificate issued to persons carrying out transport to venues.